I am interested in the following. - crawlspace mold removal and prevention. - crawlspace moisture control. - crawlspace door. - crawlspace vents. Have sloping floors in one area of the home. Need to repair the foundation and also looking for small addition. Foundation inspection and repair. in home inspection report: "Foundation cracking and/or movement was observed in the left foundation walls in the crawl space." I need a CEA dwelling retrofit verification form completed by a licensed contractor and wanted your opinion of our foundation while we are there. Please advise if this is possible. Thanks. I am planning to start second floor addition and that requires a foundation retrofit. please advise if you can provide a quote. i got the permit for this work. it is ready to start. Here at Foundation Repair of CA, we believe in the value of customer service and are proud to serve our area. We use only high quality products, installed by our excellent team of skilled technicians so that you can be sure of long-lasting results. We want to work with you to find the solution that will work best for you! Foundation problems, even ones that seem minor, destroy your home’s value and can be dangerous. Most home foundation problems are the result of weakened soil that can't support the weight of the structure. We design and install the right solution and usually have the project finished in less than a week. 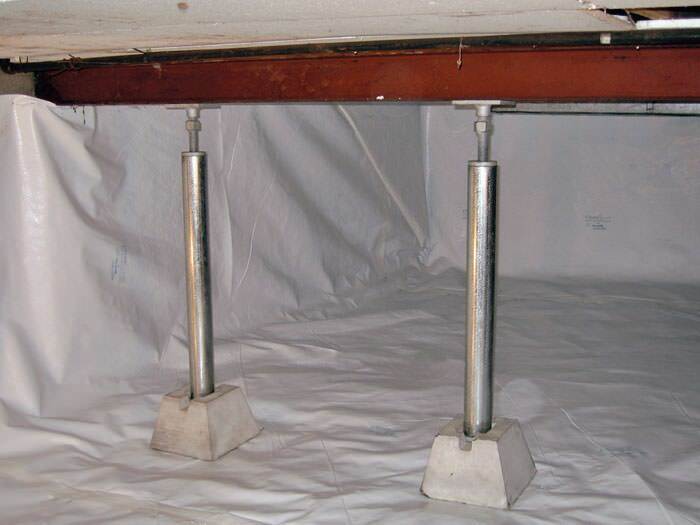 For sagging, cracked, uneven floors, we offer foundation piers and jack posts which provide a permanent solution. You will have peace of mind as we provide a 25-year written warranty against defects on our foundation products. PolyLevel® is a unique alternative to traditional methods of fixing uneven concrete that eliminates the need to replace the entire slab. The injection goes underneath the concrete slab to raise it and has injection holes that are much smaller than those required for mud jacking. In action, PolyLevel® expands to many times its original volume, forcing the sunken concrete back to its original level. Within a matter of minutes, the expanded polymer hardens and reaches 90% or more of its final strength. Don't risk the safety hazard of uneven concrete and get a permanent solution with PolyLevel®! Is your concrete damaged and worn out? Good news! Foundation Repair of CA now offers NexusPro, the durable and flexible solution to cracked concrete. Protect your concrete from UV rays and harsh weather to keep it looking new. We also offer SealantPro for new or repaired concrete. SealantPro will triple the lifespan of your concrete and protect it from damage, stains, and cracks for years to come. Do you live in an area that's prone to earthquakes? Then don't take chances with your property and contact Foundation Repair of CA to get your home evaluated. Even a home that is built with good materials can still be susceptible to significant damage during an earthquake. When you have our specialists retrofitting your home, you can have the peace of mind that should an earthquake occur, your home is less likely to be damaged or separated from its foundation. Cracks in walls in home. I have a slab. Built 1958. Hi. I saw good reviews about you on Yelp and I was hoping you can help with my new house foundation issue. Please let me know if you are available for a quote. Thank you! We have just bought a house that had minor foundation issues. We want to get them repaired. Check crawl space foundation bolts for corrosion. Review need for additional bolts. Review any additional clamping required. Free quote for replacement of insulation and repair of foundation throughout mobile home foundation.1975 born, double wide mobile home in sunnyvale. Home is 50 years old , have settling in kitchen and dining area. A lateral crack on right side of house. Smell of moisture on rainy days. We had new construction and rain yesterday caused significant ponding in our side and back yards. the landscaping is gone. We need to move the water out of the side yard via drainage system as it is next to our foundation. There are 4 downspouts into the side yard. We are interested in your downspout extension and lawnscape solutions. Perhaps a french drain? Need this done asap.